Integrated battery and solar cell; rechargeable zinc battery. 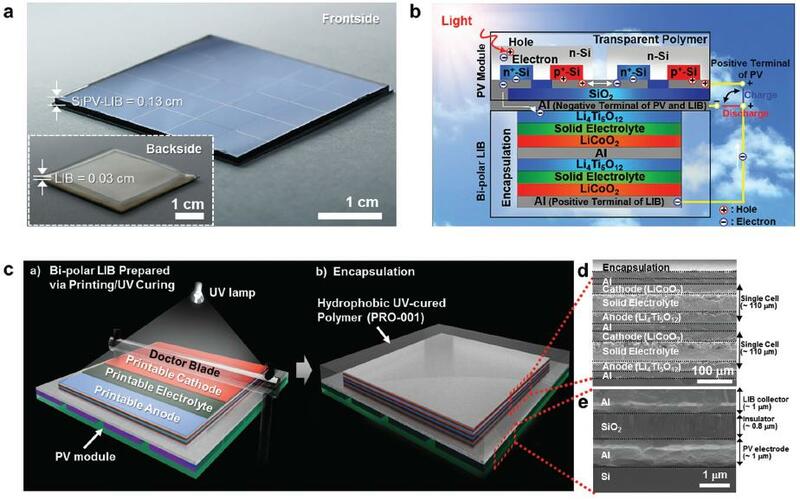 Researchers from the Ulsan National Institute of Science and Technology (UNIST) in Korea developed a single-unit, photo-rechargeable portable power source based on miniaturized crystalline Si photovoltaics (c-Si PVs) and printed solid-state lithium-ion batteries (LIBs). The device uses a thin-film printing technique, in which the solid-state LIB is directly printed on the high-efficiency c-Si PV module. According to the researchers, this single-unit PV-LIB device exhibits photo-electrochemical performance and design compactness that lie beyond those achievable by conventional PVs or LIBs alone. In the study, the research team fabricated a solid-state LIB with a bipolar cell configuration directly on the aluminium (Al) electrode of a c-Si PV module through an in-series printing process. To enable the seamless architectural/electrical connection of the two different energy systems, the Al metal layer is simultaneously used as a current collector of the LIB, as well as an electrode for solar cells. This allows the battery to be charged without the loss of energy. The team connected the device to various portable electronics to explore its practical use. They fabricated a monolithically integrated smartcard by inserting the SiPV-LIB device into a pre-cut credit card. Then, electric circuits were drawn on the back of the credit card using a commercial Ag pen to connect the SiPV-LIB device with an LED lamp. The SiPV-LIB device was also electrically connected with a smartphone or MP3 player and its potential application as a supplementary portable power source was explored under sunlight illumination. The SiPV-LIB device was capable of fully charging under sunlight illumination after 2 minutes with with a photo-electric conversion/storage efficiency of 7.61%. It also showed decent photo-rechargeable electric energy storage behavior even at a high temperature of 60°C and even at an extremely low light intensity of 8 mWcm-2, which corresponds to the intensity in a dimly-lit living room. The effort focused on water-based zinc batteries. The team demonstrated a breakthrough for nickel-zinc (Ni-Zn) batteries in which a three-dimensional Zn “sponge” replaces the powdered zinc anode traditionally used. With 3-D Zn, the battery provides an energy content and rechargeability that rival lithium-ion batteries while avoiding the safety issues that continue to plague lithium. Zinc-based batteries are a standard battery for single-use applications, but are not considered rechargeable in practice due to their tendency to grow dendrites, metal conductive whiskers which can grow long enough to cause short circuits in the battery.